The Department of Justice on Thursday announced charges against 412 people in the largest combined health care fraud bust in the department's history. Attorney General Jeff Sessions and Secretary of Health and Human Services Tom Price announced the bust in a press conference Thursday morning. Facing charges are 412 people across 41 federal districts, who the DOJ alleges have extracted $1.3 billion in false billings through a variety of unconnected schemes. The defendants include 115 doctors, nurses, and other licensed medical professionals. HHS has also initiated suspension proceedings against 295 providers, including doctors, nurses, and pharmacists. The busts also constitute the largest opioid-related fraud charging in U.S. history—120 of the defendants, including doctors, face charges for their role in prescribing and distributing opioids and other narcotics. "Too many trusted medical professionals like doctors, nurses, and pharmacists have chosen to violate their oaths and put greed ahead of their patients," Sessions said. "Amazingly, some have made their practices into multimillion dollar criminal enterprises. They seem oblivious to the disastrous consequences of their greed. Their actions not only enrich themselves often at the expense of taxpayers but also feed addictions and cause addictions to start. The consequences are real: emergency rooms, jail cells, futures lost, and graveyards." The fraud schemes targeted by the Department of Justice were focused on Medicare, Medicaid, and TRICARE, the latter of which provides health insurance for veterans and their families. They often involved medically unnecessary drugs, frequently not even distributed to those for whom they were prescribed. In many cases, co-conspirators were paid cash kickbacks for supplying information so that providers could bill Medicare for unprovided services. The busts resulted from the enforcement actions of the Medicare Fraud Strike Force, a joint initiative of the Department of Justice and HHS. Since it was created in 2007, the Medicare Fraud Strike Force has charged over 3,500 defendants collectively responsible for over $12.5 billion in fraud. Health care fraud is a persistent problem for the federal health insurance systems. The state of Florida alone has paid $70.3 million in Medicaid payments to providers facing fraud allegations since 2011. "Health care fraud is not only a criminal act that costs billions of taxpayer dollars—it is an affront to all Americans who rely on our national health care programs for access to critical health care services and a violation of trust," Price said. "The United States is home to the world's best medical professionals, but their ability to provide affordable, high-quality care to their patients is jeopardized every time a criminal commits health care fraud." "That is why this administration is committed to bringing these criminals to justice, as President Trump demonstrated in his 2017 budget request calling for a new $70 million investment in the Health Care Fraud and Abuse Control Program," Price added. 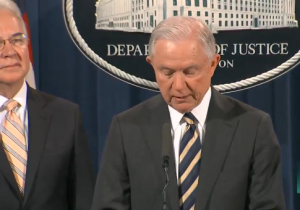 Sessions called the health care fraud takedown a "historic day" and issued a warning to those considering fraudulent activity. "While today is a historic day, the department's work is not finished. In fact, it is just beginning," Sessions said. "We will continue to find, arrest, prosecute, convict, and incarcerate fraudsters and drug dealers wherever they are. We will use every tool we have to stop criminals from exploiting vulnerable people and stealing our hard-earned tax dollars. We are continuing to work hard to develop even more techniques to identify and prosecute wrongdoers."